Apple could be working on its own augmented-reality technology, which would be a first for the company, according to Piper Jaffray’s Gene Munster. Apple usually focuses on mainstream consumer products such as smartphones, tablets, and laptops. Munster has picked up on a few clues within the industry that indicate Apple could be working on some type of augmented-reality device. For example, the company acquired a German augmented-reality startup called Metaio earlier this year, a move that was reported back in May. Munster notes that Metaio owns 171 worldwide patents related to augmented-reality technology, which would put Apple in 11th place for the number of augmented-reality and head-mounted-display patents held. Google, Microsoft, Sony, and Samsung remain ahead of Apple in that regard. Apple also acquired a company called PrimeSense back in 2013, and we have yet to see its technology appear in any of Apple’s products. PrimeSense makes cameras that can sense motion, and it is best known for making the cameras in Microsoft’s Kinect accessory for the Xbox. Munster initially predicted that PrimeSense’s tech could be used for motion detection inside the long-fabled Apple television, but that ended up being a bust. Now, however, Munster acknowledges those types of sensors could benefit an augmented-reality headset, since the motion-detection cameras could be used for indoor navigation. The company also recently poached an audio engineer from Microsoft who worked on its HoloLens augmented-reality headset. According to LinkedIn, an Apple engineer hired in July named Nick Thompson previously worked as the audio hardware engineering lead at Microsoft for the HoloLens. Audio is important in augmented reality, Munster says, because positional audio can make the experience more convincing (i.e., feeling like a certain object is in front of you or behind you, etc.). 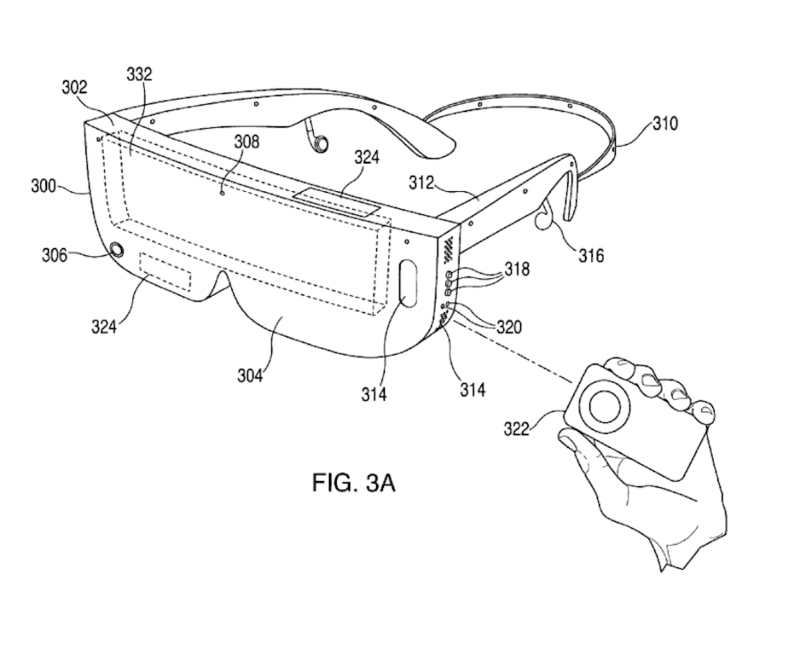 United States Patent and Trademark OfficeApple patent for heads-up display. If Apple is working on an augmented-reality project, it would be doing so at a time in which almost every other major technology company is exploring the space. Microsoft, for instance, has been showing off its HoloLens headset at recent events. Google initially hyped its augmented-reality efforts with Google Glass back in 2012, and it is said to be working on an enterprise-focused version of the headset too. The company has also invested heavily in Magic Leap, a secretive company that is working on its own augmented-reality platform, which is supposed to be mind-blowing. This would be the first time Apple has explored the augmented-reality field, though it has filed patents for technology related to AR in the past. One, for instance, covers “interactive holograms,” while another describes a head-mounted display.